One of those days that stared out grey and got even more grey as the day progressed. Out fairly early to deliver a birthday card and prezzy to Shona. Stayed for a while to talk and be entertained by Ben. After that we came home we made the curry for dinner, well actually we chopped up the veg, skinned the chicken leg, put them into the slow cooker with the curry paste and a tin of tomatoes and switched it on. Then we had lunch. To be honest, there was more work in cooking the lunch than in making the curry. Both as it happened turned out perfectly. I installed Lightroom 5 which I legally own in Scamp’s computer to replace the despicable app that Mickysoft expect you to use to manage your photos. Now I don’t like Adobe’s pricing policy, but they do know how to make an excellent photo management app. Before we knew it, it was 5pm and we were going out at 6pm to dance the night away (or part of the night away anyway) at The Record Factory in Byres Road. Got there and the place was jumping. Loads of people we hadn’t seen in years. I danced with a few girls apart from Scamp, but she danced with half of Academia de Salsa, I think, or maybe that was a slight exaggeration. Got a chance to practise one or two of the more recent moves as well as a few old ones and one completely made up one that we both liked, but which I cannot now remember! Came home and ate a lovely curry. The changes we’d made since Friday worked. 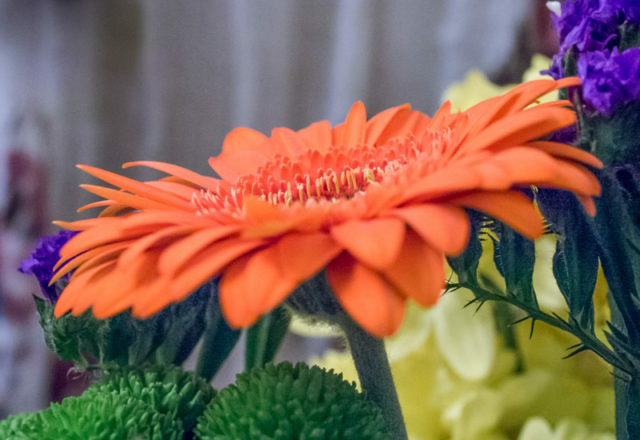 Today’s PoD was a last minute shot of a Gerbera in Scamp’s cut flowers. Tomorrow we’re hoping to go out for lunch to the Battlefield Rest.